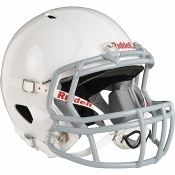 The Riddell Victor Youth Football Helmet with Facemask is a great choice for any youth player looking for Riddell technology and a great price! The Victor Youth helmet possesses the same shell design as the Revo Speed and other Riddell helmets so you can look great like the guys you are seeing on TV. Under the shell, the Victor has foam padding designed to protect the head and keep the overall helmet weight down as well as the popular over liner. The liner is removable but is very popular among athletes because it makes the helmet extremely comfortable and wicks away moisture out of the eyes and head. The inflatable jaw pads also allow for a custom fit when you put the helmet on!